A Brisbane professor conducting the world’s first study into meat-eating rainbow lorikeets says he is shocked to discover more species of herbivorous birds are also changing their diets. ABC revealed a population of rainbow lorikeets were eating meat from a backyard feeding station on a property at Elimbah, north of Brisbane. Griffith University’s Professor Darryl Jones is shocked. He said lorikeets usually eat nectar and pollen which they obtain from native plants and shrubs. 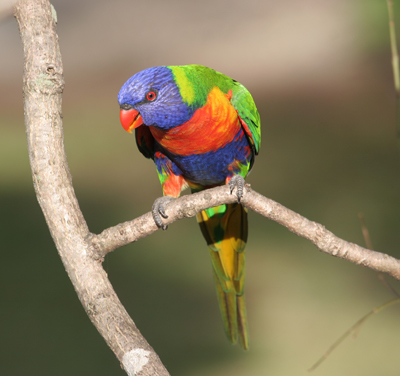 Lorikeets typically feed on nectar and pollen and only require a small amount of protein from an occasional insect. At this stage, no ill-effects have been documented. Along with rainbow lorikeets, eastern and crimson galahs and cockatoos have also been spotted eating meat. Bill, who owns the Elimbah property, has put out pets mince for magpies, currawongs and kookaburras. He also puts out seed for vegetarian birds like galahs, king parrots and the lorikeets. The birds are spoilt for choice when it comes to food! “At first they went for the seed but then they started chasing the other birds away from the meat, which surprised me,” he said. “It makes no sense at all” said Professor Jones. “The Lorikeets are chasing magpies and kookaburras away from the meat”. He said the lorikeet population had increased dramatically in south-east Queensland in the past decade. Lorikeets are also being fed by thousands of Queenslanders in backyard feeders. So, they are not adapting to deprivation, or survival! Professor Darryl Jones would like to hear from anyone who has observed lorikeets eating meat. “We also really want to find out whether it’s a harmful practice because it’s (backyard feeding) very widespread”. We also have meat-eating lorikeets on NSW Central Coast near Ettalong Beach. We have feeders of seed which attract lorikeets, King parrots, eastern rosellas, galahs and corellas (also cockatoos when we’re not watching). We put out mince for a group of about eight kookaburras but lately the lorikeets have taken over not allowing the kookaburras near the meat. They love it, but should they be eating it?